I received my new Camera today, a Nikon Coolpix s50. I ordered it from Ritzcamera.com, free shipping and free sales tax. I went to the store to look at it first, but why pay sales tax. I would just rather wait and order online and have them ship it ground to me. 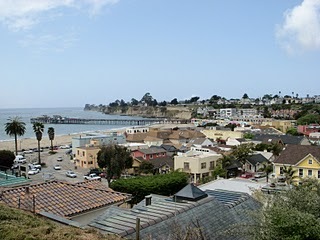 Here are a couple of pictures of Capitola, CA. 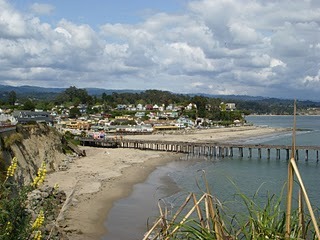 I live just up the hill (5 min walk) from the Capitola beach village. The Camera itself can fit in the small front pocket of the 2 in 1 pants that I wear which closes with a button. The cables and battery charger has added some bulk. The space in my backpack is at a premium right now. I am going to look closely to see the best way to pack all of the accessories. I avoided getting a camera that has a pop out lens because if some sand gets in between then its history. I guess the perception is that this would one of my most “Valuable” possession. I personally don’t see it as such. My backpack and rain gear are more valuable to me then a camera. When I travel I will not be wearing any watch, rings or any type of jewelery. The watch that I will bring clips on to my belt loop under my shirt. Many travelers have said “it’s best to look poor”. Of course a camera would sell quicker then a backpack. But like I was saying I value what is essential such as a good pair of walking shoes. In the mean time I think I will be taking pictures of the area I have lived for the last 8 years and post them. The last camera I had was back in 1990, I must say they sure have changed from the old 35mm. I am the process of reading the manual. I hope you enjoy the pictures that I will be posting and if they are not on the blog they will be on the shutterfly slide show below.